You are getting quotes for auto insurance and trying to find the best value on an insurance policy. You get a great quote that is affordable and offers all the policy options you are looking for; but then the insurance company comes back and tells you that the cost of the insurance premium is more than you were originally quoted. What happened? It could be because of insurance points. Insurance points are violation points assessed against your driving record by your state’s department of motor vehicles for traffic violations and/or at-fault accidents. The number of points added to your driver’s license for an offense varies by state. Many insurance companies will check your driving record before finalizing your insurance quote or possibly after you have purchased an auto policy. In the latter case, if your driving record from your state’s department of motor vehicles comes back showing tickets/accidents that you did not initially report on your insurance application, your auto insurance rates may be significantly higher than the pricing the insurance company originally quoted. So, use your due diligence and learn more about the things that can make your auto insurance premium increase including these 10 things you should know about insurance points. Not all tickets or accidents end up on your driving record. Driving offenses can be either moving or non-moving violations. Many times, a first-offense, non-moving violation will not end up on your driving record. 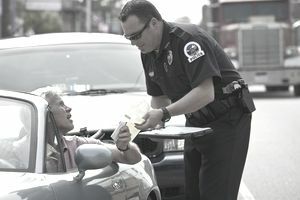 Non-moving violations are things such as not wearing a seat belt or failure to produce proof of insurance when stopped. Also, there is always the chance that the police department may not report a violation to the department of motor vehicles, especially in a first-offense situation. Of course, you can never be sure of this without checking your driving record. Not all states use the point system. While many states use a point system to track violations on your driving record, not all of them do. So, chances are, if you live in a state that does not use a point system, your driving record may not reflect the violation. There are nine states that currently do not use a point system, including Hawaii, Kansas, Louisiana, Minnesota, Mississippi, Oregon, Rhode Island, Washington, and Wyoming. However, just because you are not being assigned points against your driving record does not mean your driving violations are being ignored. These states monitor your driving violations and if you continue to accumulate offenses, your license could eventually be suspended. Driver’s license points and insurance points are not necessarily the same thing. If you are unsure about the price of an auto insurance quote, ask the insurance agent more about what points are being charged on your auto insurance quote and how this affects the premium. You may be charged for insurance points assessed by the insurance company itself rather than points charged against your driver’s license. You can pay extra for auto insurance based on where you live, the type of car you drive or for prior auto insurance claims you have filed. You may be able to remove insurance points from your driving record by attending an approved driving course. These courses generally teach good traffic safety practices. In some cases, taking an approved course can keep a driving offense off of your driving record completely. This option is sometimes offered in traffic court and is a good option to keep your auto insurance rates from increasing. You should know your driving record before buying an auto policy. The best practice is to know what your MVR (Motor Vehicle Record) report shows before you try to buy an auto insurance policy or switch insurance companies. It is highly likely that any auto insurer will at some point check your driving record. If you are not forthcoming about any tickets or accidents on your driving record, your auto insurance quote will not be accurate and the rate will go up once the insurer accesses your MVR report. If you are unsure what offenses are listed on your driving record, you can obtain a copy from your Secretary of State’s office for a small fee. The fees vary from state to state. Some online services also provide access to your MVR report, but for a substantially higher fee. Tickets and accidents aren’t the only things that can increase your auto insurance premium. If you notice an auto insurance increase in premium, the culprit may be something other than points against your driving record. If you have poor credit, many auto insurers will charge a higher premium. Also, if you have recently moved, your location may be considered “high risk” meaning there is more traffic and accidents are more likely to occur. Changing vehicles may also make your auto insurance premium increase. These vehicles typically cost more to insure: luxury cars, sports cars, convertibles, vehicles that perform poorly in safety tests and vehicles with a turbo-charged engine. Some types of violations will definitely increase your auto insurance rates. Major violations are reported to the department of motor vehicles are will show up on your driving record. Some of these major violations include racing, DUI or impaired driving, reckless driving, refusing a breath test for DUI, hit and run (failure to stop), fleeing from police or driving on a suspended license. If you end up with too many violations, your auto insurer could drop your coverage. If this happens, you may be considered a high-risk driver and only able to purchase high-risk auto insurance from a carrier who offers it. These insurers typically also provide the SR-22 requirement if you are required to file it with your state. There are some violations that typically do not affect your insurance rates. For a first offense, a minor non-moving violation may not show up on your driving record or affect your insurance rates. However, if you continually receive multiple tickets for even minor violations, you may eventually be charged points on your driver’s license. Some of these minor violations include: safety belt or child seat, failure to yield, speeding, improper passing or turning, passing a school bus, expired driver’s license, no proof of insurance, broken tail lights, not displaying license plate, parking violations, noise violations, registration violations, failure to appear violations, texting or following too closely. It is difficult to determine how much your insurance premium will increase. There is no way to tell how much your insurance premium will increase after a ticket or accident is reported on your driving record. Every insurance company has its own formula for calculating insurance points and how much these points will increase your auto insurance rates. If you have an insurance company that offers accident forgiveness, your rates may not go up at all after your first accident. A major driving offense could affect your insurance rate for up to 10 years. The amount of time a driving offense will remain on your driving record varies by state. For major offenses such as a DUI, auto insurers may check your record as far back as 10 years. For other violations, an insurance company may only check your driving record for the past three years. If you are unsure, you should ask a company representative to explain how insurance points are used to calculate your auto insurance rates. First of all, when buying auto insurance, you should obtain a copy of your driving record from your state’s DMV (department of motor vehicles). Review your record and if you have tickets/accidents on your driving record, shop around for the best rates. Auto insurance comparison sites such as Compare.com, CoverHound, NetQuote, or Insure.com may be helpful in this process. Before making a final choice on your auto insurer, it pays to check out the insurance company’s customer service record through consumer organizations such as J.D. Power & Associates and its financial strength rating through insurance rating organizations such as A.M. Best. It pays to be truthful on your insurance application because the insurance company will check your driving record sooner or later and you will be charged a premium that correlates to the driving violations found there. Take a driving course if possible to remove some of these violations and do your best to remain ticket and accident-free. After some time, the violations will fall off of your driving record and your auto insurance premium will decrease.